Having covered Constitutions stunning victories, ask the class: What does it take to win? Students might suggest being brave or strong, but probe the issue. How do you become brave or strong? They might suggest by practicing or mastering skills. Tell students that people also need to have a routine to support their goals. The regimen of life on board Constitution helped the crew to succeed. Help students understand that the shipboard community was in many ways similar to your school community, made up of interdependent members, each with his or her own job. For example, the students job is to learn, the teachers to teach, the janitors or building supervisors to clean and make repairs, and the nurses to take care of health concerns. Use the Crew Cards from Lesson 5 to identify the different members of the shipboard community. Which positions match those of the school community and which are different? 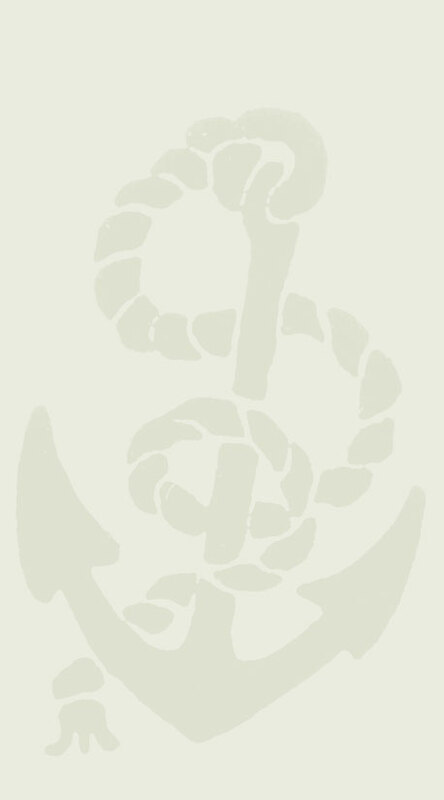 Midshipmen could be considered students, since they were on board to learn. The steward helped to serve food to the officers, and the boatswain (pronounced BO-suhn) could be comparable to the building supervisor, although sails and rigging were his main concern. After finding the similarities, ask students how life at sea would be different from going to school. As clues, have students consider the parts of the ship covered in previous lessons  sails, rigging, cannon. Then ask them to examine the titles on the remaining cards and see if they can figure out what the jobs were. 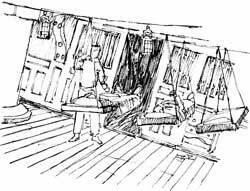 Gunner, carpenter, and sail maker were in charge of maintenance and repair of guns, all woodwork, and sails, respectively. The chaplain saw to the crews spiritual needs and sometimes served as the captains secretary or as teacher for the ships boys and midshipmen. Ask students to examine any unidentified Crew Cards and pick three that interest them. If yeoman is among the cards, tell them the first woman officially assigned to serve on board Constitution, Rosemarie Lanam, was a yeoman (in the 1980s). Identify a few of the unknown cards, and save the rest for the game that goes with this lesson. The Marines constituted the security force or police for the shipboard community. In battle, they rained shot down on the enemy from their vantage point high in the fighting tops, platforms on the masts. They were also trained to board enemy ships and engage in hand-to-hand combat. Able bodied seamen had experience at sea, ordinary seamen had some experience, and landsmen were greenhands who had never been to sea before. The seamen were the general labor force of the ship whose duties encompassed everything from scrambling up the masts for sail handling to firing the long guns in battle. The daily routine on board Constitution included some of the same activities people do ashore. Where did your students have breakfast this morning, and who ate with them? Sailors ate in groups called a mess on a tablecloth of old canvas spread out on the berth deck. One of the mess mates would go to the galley, the area of the gun deck that served as a kitchen, to collect the rations, or daily meal allotments, for the members of his mess. What do students sleep in at night? Sailors swung from hammocks. When not in use, the hammocks were stowed in netting on the spar deck. Ask students what happens when they break the rules. Because so many lives were at stake, punishment for sailors who broke rules was severe. During the perils of battle or rough seas, a careless mistake could cost a life. Such offenses as disrespect, cowardice or negligence, perhaps as minor as not cleaning a pan thoroughly, were grounds for punishment. The captain was the highest authority, and his word was law. 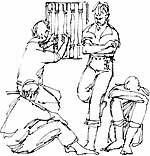 Sailors could be assigned extra duty, or they could be flogged, or beaten, with a cat-o-nine-tails, a whip of nine lashes bound at the handle. Punishment was administered on the spar deck before the entire crew to keep the consequences of disobedience fresh in everyones mind. To highlight a major difference between school and ship life, ask students where your school is located. Constitution had no such fixed address, and, especially at sea, she was open 24 hours a day. Members of the crew always had to be on deck to maneuver the ship safely, to adjust sails to changes in weather and to look out for other vessels.To share the work load and allow everyone time to sleep, the 24-hour day was divided into watches, periods of four hours each, with two dog watches, or two-hour watches, in the late afternoon. Thus the day was divided into seven periods, allowing for periods of work and rest, without a sailor having to suffer the monotony of working the same watches from one day to the next. Watches provided the structure and kept everyone on the same clock. Do bells ring to mark the beginning and end of classes? Bells marked half-hour intervals of each watch, beginning with one bell at the end of the first half hour. At eight bells, a given watch was over, and the duty rotated. An essential skill for Constitutions success was navigation, figuring out how to get from one place to another. It was the responsibility of the Sailing Master to compute Constitutions location and set the course, or direction, of sail. When Constitution was launched, there were no reliable chronometers, clocks that kept accurate time at sea, nor speedometers to measure how fast the ship was moving, nor radar to identify obstacles or ships. Give students a few clues and ask them to suggest ways in which the sailing master might have figured out where Constitution was and in what direction she needed to sail to reach a port or to find enemy vessels. To measure proximity to shore, especially in foggy conditions, sailors used a lead line, a length of rope tied with a weight, to measure the depth of the water in fathoms, or units of six feet. A magnetic compass told direction. Constitutions speed was calculated by turning a half-minute sand glass and counting the number of knots that ran out on a line cast overboard with a chip of wood called a chip log at its end. All of these navigational measurements, as well as other relevant activities on board, were recorded in a book not surprisingly called the log. From the record of speed and direction and several other calculations, the sailing master would deduce the ships course, writing the words ded.reckoning, short for deduced reckoning, on his chart. The term dead reckoning, commonly used today, is derived from the sailing masters shorthand.